Mirian Raas comes from a long line of salvagers—adventurers who use magic to dive for sunken ships off the coast of tropical Sargava. With her father dead and her family in debt, Mirian has no choice but to take over his last job: a dangerous expedition into deep jungle pools, helping a tribe of lizardfolk reclaim the lost treasures of their people. Yet this isn’t any ordinary dive, as the same colonial government that looks down on Mirian for her half-native heritage has an interest in the treasure, and the survival of the entire nation may depend on the outcome. From critically acclaimed author Howard Andrew Jones comes an adventure of sunken cities and jungle exploration, set in the award-winning world of the Pathfinder Roleplaying Game. 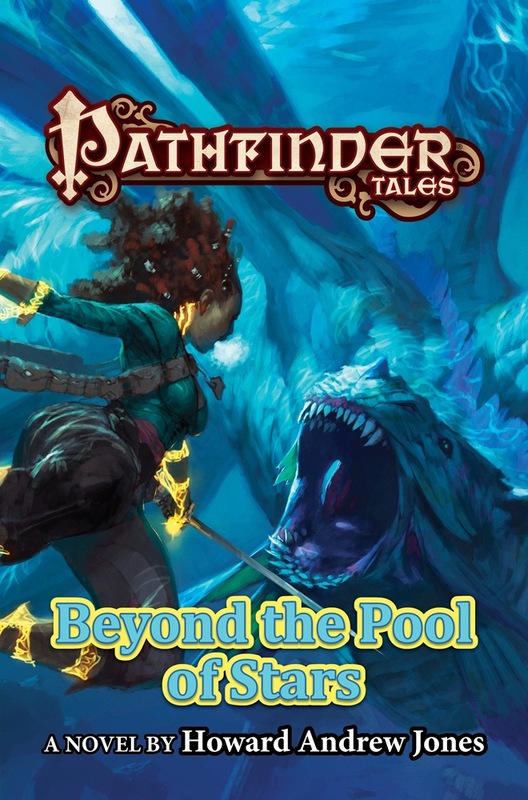 Beyond the Pool of Stars is sanctioned for use in Pathfinder Society Roleplaying Guild. Beyond the Pool of Stars is a heart-touching story set in an often-overlooked corner of Golarion. 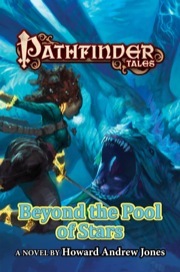 While I have enjoyed many other Pathfinder Tales novels, this one was "close to home" because I'm running the Serpent's Skull adventure path as well as an Eleder-based revolution campaign. I was a little worried that it would follow the mold of Serpent's Skull and be a tacit endorsement of pulpy imperialism, but it was actually very complex and respectful. The main goal of the protagonists is to help a dying lizardfolk tribe reclaim its cultural heritage, rather than to e.g. loot a Mwangi tomb and sell relics. The characters - Mirian, Jekka, and Alderra especially - had depth and well-defined motivations, and when they were in trouble I was on the edge of my seat. This is a fast-paced narrative with complications in every chapter, and although it didn't quite have the unspooling motivations of Stalking the Beast, it was a bit more of a pageturner because I cared about the characters more. One of the few things I didn't like about the book was the number of deaths! I won't spoil which ones, but some of them felt extraneous to the narrative - and they unfortunately didn't enhance the realism, because I'm running a game in the Mwangi Expanse and I gotta say we're not having that many casualties. Another beef is that Jekka and Mirian didn't get together, but I can't say I expected that. I do need to commend Howard Andrew Jones on the realism of his lizardfolk characters. Their relationships with humans and each other are among the best parts of the book! And they inspired my own group of three lizardfolk in the aforementioned SS campaign. This book has been a great resource for both my campaigns and I fully intend to have the Raas salvaging family interact with my parties in the future. Overall, this is my favorite Pathfinder Tales novel read so far. It's got great descriptions, great characters, and a compelling narrative. Having read Plague of Shadows and then Stalking the Beast both in the past week, I was honestly a bit crushed to find the author had moved on from Elyana's adventures, and started w/ a new character. Also, of the 9 PF novels I've now read, this was only the 2nd outside of Avistan, so I really appreciated the change in setting. If only b/c it was fresh and new to me. I can't help but admit I didn't care for this as much as his previous 2 novels, as I compare Mirian Raas to Elyana anyway. I deeply appreciate and admire what he did w/ the Lizardfolk, though. I was rooting for them long before the end, and I will have a hard time playing a PnP game and considering them mere enemy fodder after reading this book. I adored this book. The plot is sufficiently convoluted (hmm that word sounds bad... whats the good version of it?) to be very interesting, the characters have interesting struggles and flaws, the ups and downs were fun to read and in no way paint-by-numbers or telegraphed 100 pages in advance. It truly felt like there were six or so main characters, all fully flushed out and well crafted to stand on their own. I pray theres a sequel! Best of all, my goodness do you get won over by the lizardman culture. it is so alien to our own, but it comes to life, in a consistent and highly believable fashion. I dont know if Mr Jones patterned it after Mayan or who knows what on earth, but it is so believable and yet clearly alien to "human" culture that it is worth the read just by itself. Its internal logic is clear and, as you learn about them, all of their actions make perfect sense under their foreign set of values of what is important and unimportant. Great story, great characters, and all set with a clash of cultures - how many books can you say had you on the edge of your seat as two characters discussed the meaning and purpose of a legal contract? Haha! Its fantastic, a must-read for any fantasy fans. Every character rippled off the pages with life - keep these coming! Set in the secessionist colony of Sargava, Pool of Stars is a rolicking adventure with politics, archeology, and probably the most fully realized lizardman characters put to page. While I enjoyed Plague of Shadows and Stalking the Beast, HAJ's latest is frankly leaps and bounds above his previous Tales novels. Definitely pick this one up. Announced! Cover image is not necessarily final. I've said it before, I'll say it again: eeeeeee I LOVE the cover art on this one. Super excited to read it! Ooh, I like the cover, too. Is that a drake or a primal dragon? I'm very excited for this one! As much as I don't like the anti-Mwangi attitude of the Sargava colonists, I do believe that their the only ones currently capable of keeping the demon worshiping Bekyar tribe in line at the moment. It appears to me to be an aquatic dinosaur (though I could be wrong on that). It does appear to have some sort of vestigal appendages (perhaps wings) so you might be right on the Primal Dragon guess (aka a Brine Dragon might not be too far off). I looked in the bestiary and the sea drake might be a good fit. It's hard to say, not seeing a good view of its limbs. …Sea drake for the win! I've loved the cover since I first saw the original pencil sketch! Monsters are my jam. It's why I got into the hobby. A novel with Lizardfolk as a focal point? Happy day! Updated with final product description and image! I was super excited to see the original cover art sketches on this at GenCon last year, and I love the idea of underwater adventures. Excited to see this available. Well done, Howard! Mirian has her family's debt, the lizardfolk want their ancestor's treasure, and Sargava needs the treasure as a whole or else it won't be able to pay for the Shackles Pirates protection anymore. So, either way this plays out, someone's gonna lose (unless Mirian can either find something even more valuable or figure a way out of her situation). So, Mirian is Half-Mwangi / Half-Chelexian then? Is her Mwangi side Bekyar? I'd imagine that would cause some issues with trust and the lizardfolk / Sargavan government. This is really good. Just finished chapter 20 (no spoilers but: No Way!) and this is great stuff. Tyler Jacobson just won a Chelsey Award for this cover! Congrats to Tyler and to Howard!